Two Dot Books, 9780762796014, 238pp. In the mid-nineteenth centrury, Martha Maupin left home at a young age and defied her parents to marry the dashing Garrett Maupin. After years of hardship and difficult marriage, Garrett Maupin died in 1866, leaving Martha alone on the frontier with her young children. Single mothers had few options in her day, but with an unwavering spirit, Martha seized her dream and bought her own farm. Few could have predicted that her life would intersect with some of the most extraordinary events in antebellum American history, eventually leading to her journey to a new life on the Oregon Trail. A Place of Her Own is the story of the author's great-great-grandmother's daring decision to buy that farm on the Oregon frontier after the death of her husband--and story of the author's own decision to keep that farm in the family. 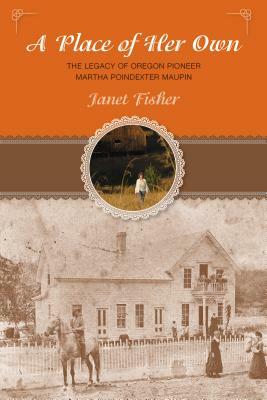 Janet Fisher's journey into the past to uncover her own family history as she worked to keep the property interweaves with the tales from her ancestors' lives during the years leading up to the Mexican-American War in the East and her great-great-grandmother's harrowing journey across the Oregon Trail with her young family and finally tells the tale of Martha's courageous decision to strike out on her own in Oregon.